Review in Association of Science Educators Journal: This book is about the history of scientific discoveries. 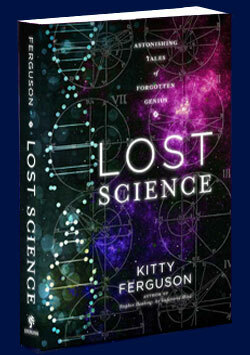 Kitty Ferguson has, after her personal research, chosen ten scientists who were involved, though often not acknowledged — in scientific discoveries from the first century CE to the 1960s. What I particularly liked about this book (in addition to its highly readable text) was that in every chapter I learnt something new and surprising. If I had heard of the scientists I learned some new aspect about their work, and where I hadn’t heard of the scientists I was amazed to learn of their significant contribution to our science understanding. Review in CHOICE: The saga of science has many adventurous stories, and this work presents riveting accounts of some that are unknown or unacknowledged. This is a beautiful, well-written and -illustrated work that does a good job of bringing out various less known people and moments in science. It is definitely a worthwhile read.